Let our experienced contractors create a beautiful, long-lasting, waterproof design for your Massachusetts and Rhode Island basement. The Total Basement Finishing System™ (TBF) has been carefully researched and designed by the best, most experienced basement finishers and waterproofers in the business. Utilizing the latest products and techniques, the Total Basement Finishing System works for basement finishing of all types, while also being appropriate for the unique environment of your particular basement. New England Total Basement Finishing, your local TBF™ contractor, would like to help you transform your damp, musty basement into dry, beautiful and unique space. If you'd like to take the first step in taking advantage of that unused floor space in your Massachusetts and Rhode Island basement, call us today! Our services are available in Boston, Quincy, Brookline and surrounding areas. The TBF™ system is made to perfectly fit your basement environment. It's versatile enough to work with any design idea you have in mind for the space - from a family room, to a home gym, to a wine cellar and more. Your basement is a unique environment, with challenges that do not appear anywhere else in the home. Obstacles such as low ceilings, utilities, and dampness are exactly what the TBF system is designed to handle. We can overcome any challenge! Our free-standing basement wall panels make excellent wall partitions for building rooms in your basement and partitioning off a space for storage. High quality ceiling tiles can box out ducts and pipes, with each tile providing an access point for servicemen. We can build in basements of all types, even if your walls are made of stone or are not straight. 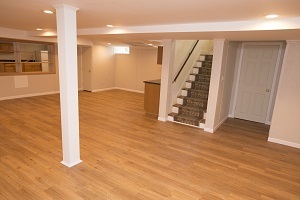 Call us today to get a free estimate on how to customize your finished basement. 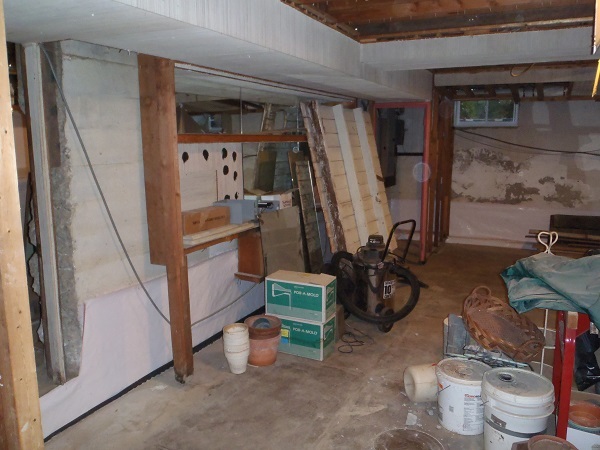 This wet, moldy basement was cluttered and unusable. The Total Basement Finishing system transformed the basement into a dry, comfortable living space. Our walls are solid enough to easily support the weight of mounted light fixtures, while our basement windows and window wells are designed to maximize natural light. 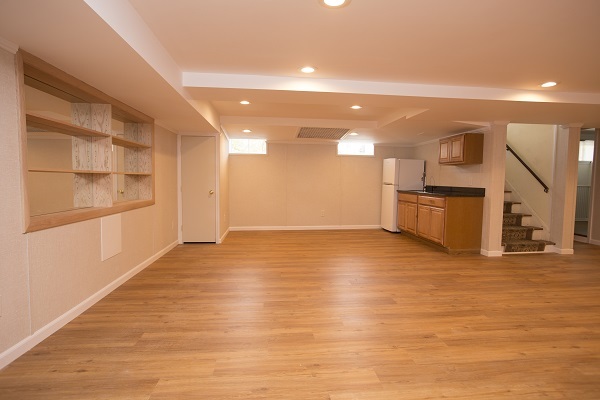 Our basement walls are designed with an appealing beige and off-white blend. These are two colors that will never go out of style. The vinyl surface of the wall is very durable and easy to wash. Even stains from marker, pen, and paint are easily washed off. With many different finished floor designs, we have a waterproof flooring option for every style finished space. Additionally, we have a wide variety of crown molding designs, ceiling tiles, and basement wall designs that we'd like to discuss with you. 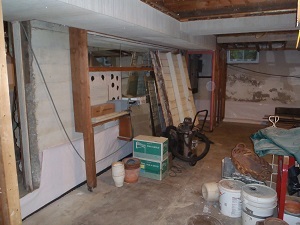 Drywall, organic materials, and fiberglass-based products are simply not up to the job in a finished basement. Our The basement wall panels, ceiling tiles and flooring we install are created with waterproof materials that are built to last, without absorbing moisture. Call us today to receive a free estimate! New England Total Basement Finishing is your local basement finishing company in the South of Boston, Cape Cod, and RI area, including Quincy, Boston, Brookline and nearby areas in Massachusetts and Rhode Island.